Bev's books are also available on Amazon as hard copy or kindle versions! ​ TWO NEW TITLES AVAILABLE! This clear, practical workbook shows you how to build your skills day by day to help you master your anxiety. hope and relief to thousands of readers both nationally and internationally over the past twenty years. help to quickly convey meaning and provide easy-to- comprehend examples of the key steps to recovery. Other titles written and illustrated by Bev but which are no longer in print include her first illustrated book Purrsonalities - Life with your Cat, followed by Muttmobiles -out and about with Man's Best Friend and two mini format titles The Little Book of IT (now sold in normal format as The Book of IT) and Recovery- a journey to healing. 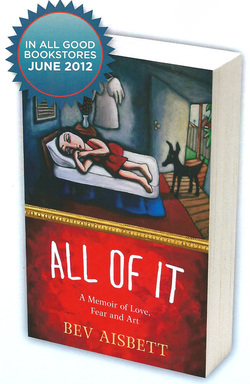 Bev also collaborated with Sydney psychologist Elizabeth Reiger in 1998 to create Get Over It- Beyond the Body Beautiful . Several of Bev's self-help titles have also been translated into foreign languages including Chinese, Japanese, Korean and Spanish (Mexico and Portugal) by publishers in these countries and HarperCollins has just announced the launch of Harper360 which will introduce Bev's books into a wider global market, including the U.S. and U.K.
evolution as a writer and artist. This moving and lyrical book reveals Bev’s talents not only as a non-fiction author but also as a creative writer and the artwork featured on the cover is Bev’s painting The Long Sunday. 'You get what you ask for' is the main premise behind the so-called Law of Attraction materials made popular by books such as 'The Secret' in recent years. So is it true that do get what you ask for? In this latest title, Bev puts the basic principles of The Law of Attraction to the test as a new and innovative approach to anxiety management and finds that, in the main, the answer is YES! The good news is, you can learn how to stop asking for TROUBLE and learn how to ask for good things and get them instead. ASKING FOR IT is typically Bev - simple to understand, no-nonsense and practical, with a touch of humour along the way, provided by her inimitable cartoon format. This version of Bev's landmark original has been produced to celebrate 20 years of what is considered by thousands of readers to be the anxiety 'bible'. Bev’s first illustrated self-help title hit the best-seller list in the first week of its release in 1993. Living with IT introduces the cartoon character IT , which Bev created to give voice (and the opportunity to 'talk back to'!) the 'inner critic'; a device which rapidly assists the reader to identify and address the negative and anxiety-provoking thinking style common to anxiety. Illustrated throughout with Bev's uniquely devised cartoon format, Living with IT simply and clearly explains the nature of anxiety and the key steps to quickly and effectively reduce anxiety symptoms. Living with IT is especially helpful to those in the first stages of anxiety and panic attacks. Along with Living with IT, Taming the Black Dog – a Guide to Overcoming Depression has become a classic. Released in 2000, this version is a fully revised and expanded version of the original book. The new material takes the reader deeper into the recovery process and challenges the thinking that keeps one stuck in the trap of depression. This version has been designed to tackle resistance and inspire the reader to step beyond a sense of limitation and powerlessness. In 2010, having read and appreciated the refreshing approaches of the Happiness Trap, Bev approached Dr Harris with the idea to do an illustrated version of the book, using the same simple cartoon format which has made her IT books so popular with readers. Already a fan of Bev's books, Dr Harris readily agreed. The Happiness Trap explores the damaging myth of and quest for 'happily ever after' which is in reality is a cause for considerable unhappiness in our lives. Using the principles of ACT - Acceptance and Commitment Therapy, Bev has condensed and illustrated Dr Harris' landmark original into a simple, easily accessible version which reveals the healing potential to be found through embracing, rather than avoiding the challenges of daily life. 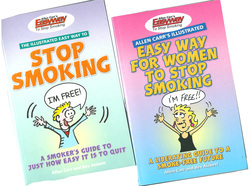 Utilising the same effective and simple-to-understand cartoon format which has assisted thousands of readers to recovery from anxiety in her IT books, Bev, in conjunction with the original author, has re-invented the enormously successful Easyway to Stop Smoking and Easyway for Women to Stop Smoking books by Allen Carr. Allen was originally a 100 cigarette a day smoker until he discovered his revolutionary formula for quitting. Thousands of people worldwide, including actor Anthony Hopkins and entrepreneur Richard Branson, have now successfully quit using Allen Carr's methods and Bev's illustrated versions of his books have provided further highly effective tools in assisting smokers to stop their smoking habit once and for all. Published by Arcturus Publishing U.K.